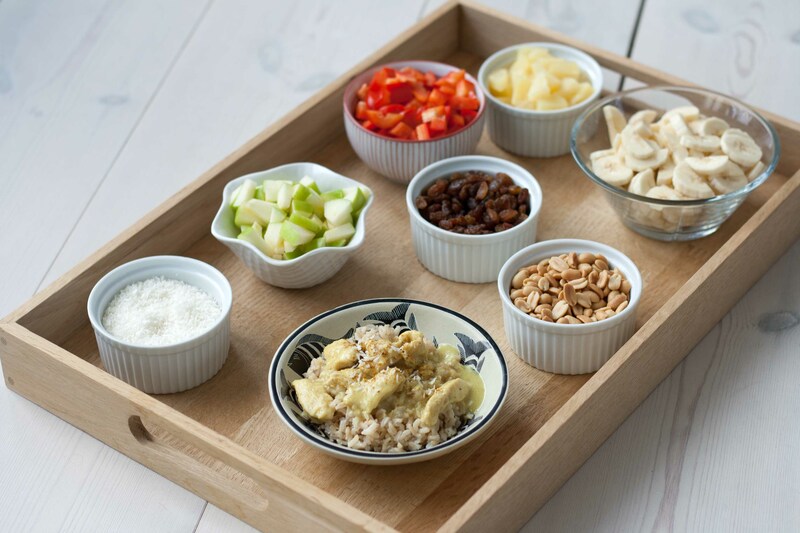 Rijsttafel is a Dutch word which can be translated to ‘Rice table’. 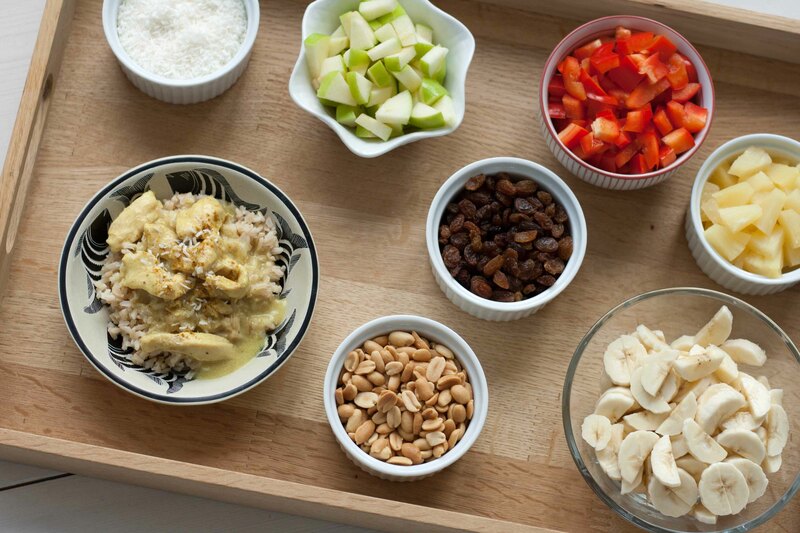 Indonesian Rijsttafel is basically boiled rice which is served with a lot of different side dishes. I love this concept because it is possible to make it the exact way you like. The only limit is your imagination. 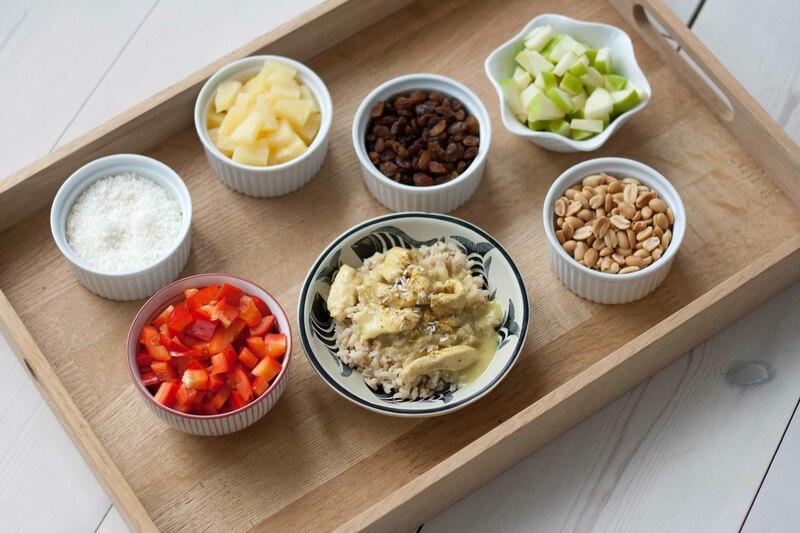 Personally I normal make some chicken curry sauce and prepare 5-7 side dished, typically only healthy stuff like vegetables, fruit, nuts and similar. Together with boiled rice (white or brown) this is a delicious dinner I bet both you and your family will love. 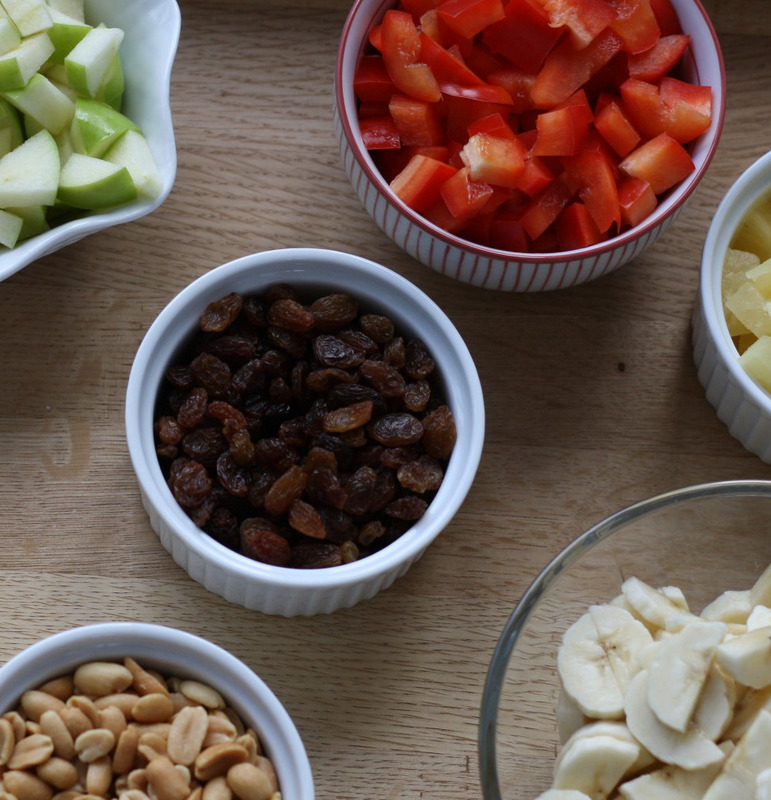 This dish is easy to prepare which is why I use it on a regular basis. I have also served this dinner for guests with great success. I seems that people, and especially kids, find it funny to sit a table and put together their own dish from the many different choices. If you make sure to leave out all the greasy and fried stuff this can both be a very healthy and tasteful dinner. 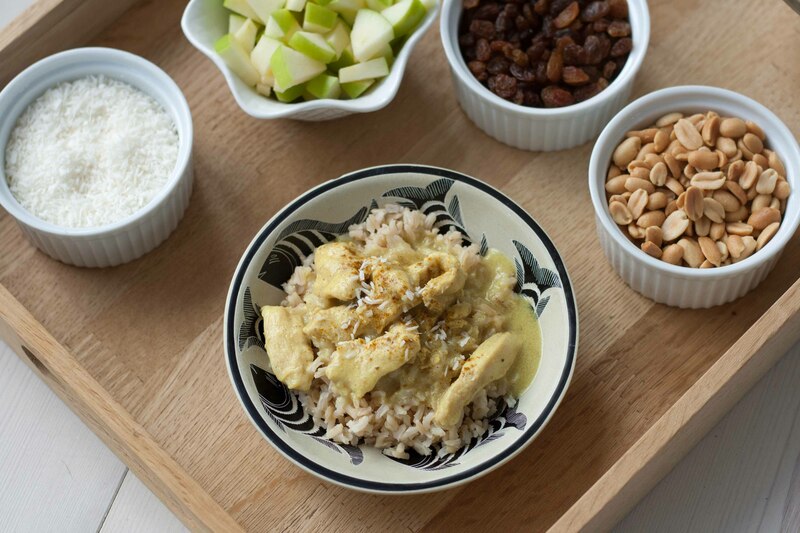 In this recipe I have made a chicken curry sauce which I served with cubed apples, pineapples, red pepper, peanuts, raisins, banana, grated coconut and of course boiled rice. Step 1: Heat up a little oil or butter in a saucepan and add the curry paste. Stir. Step 2: Add the diced onions and fry until they are softened. Step 3: Add the chicken strips and fry them till they are approximately 90% done. Step 4: Add the coconut milk, milk and the chicken stock. Let is simmer for about 10-15 minutes (Use this time to prepare the side dishes). Step 5: Use the Maizena cornflour to thicken the sauce as you like it and let it simmer for another 5 minutes. Serve with boiled rise and some of your favorite side dishes. As an inspiration you can use the list below. This may not be authentic indonesian but it was a very popular dish in the US in the 1960s or so. It’s listed as Rice Table in the Joy of Cooking (6th edition). 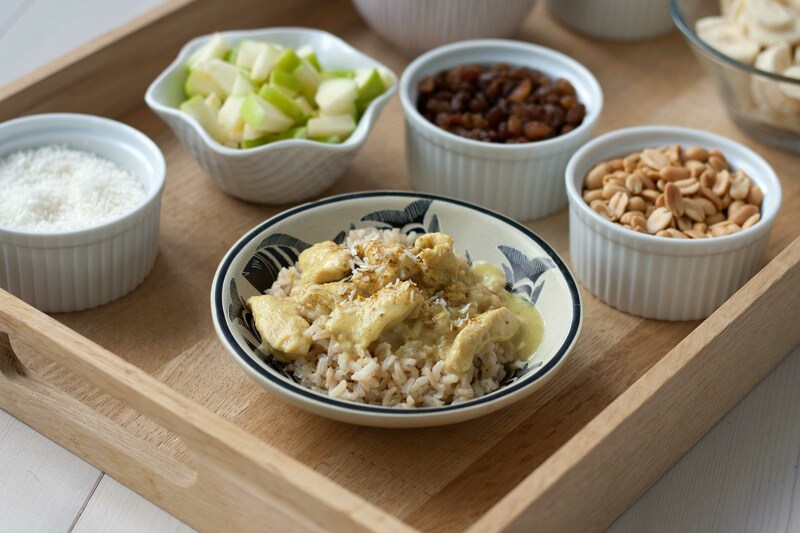 I recall my mom serving a chicken curry and rice with small bowls of raisins, grated coconut, diced cucmber, peanuts and Major Grey’s chutney. Thanks for the recipe. I had this in London in 1969 and loved it! 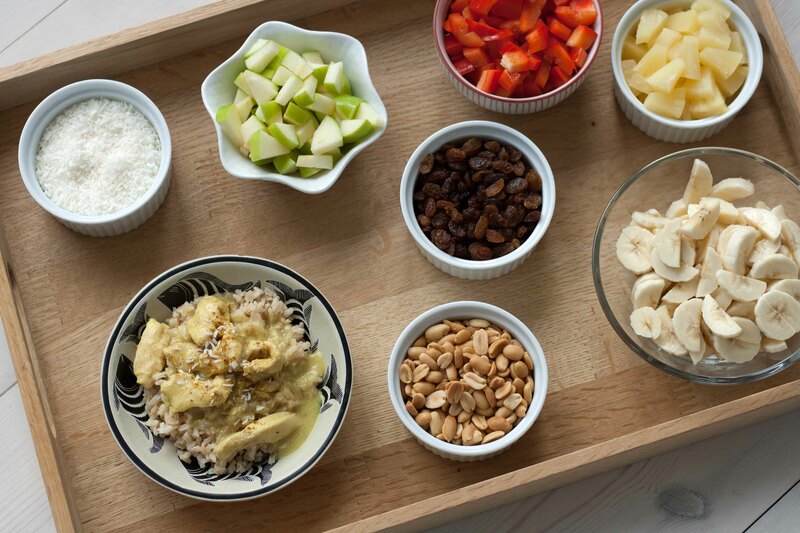 I think my grandchildren would enjoy choosing their toppings. It’s a fun dish to eat and to serve!